This June, during Men’s Health Month, we want to shine a spotlight on an area of men’s health that can occasionally get overlooked. While prostate health is one of the most commonly discussed men’s health issues, benign prostatic hyperplasia (BPH) is a condition that doesn’t get as much attention as other diseases. But BPH affects approximately 15 million men in the United States and it’s worth ensuring that men are educated about the disease and know how to handle it. BPH occurs when noncancerous cells begin to proliferate to the point that the prostate increases in volume and causes the urethra to get compressed. This leads to difficulty urinating and to bladder dysfunction because the outflow from the bladder is obstructed. Although the disease is not malignant, it can affect the quality of life of men who experience symptoms. BPH symptoms usually include trouble urinating, urinary tract infections, and acute urinary retention. In more severe cases, BPH can lead to renal failure, hematuria, and bladder stones. Anyone who is experiencing these symptoms or thinks they may have BPH should talk to their doctor about treatment options. 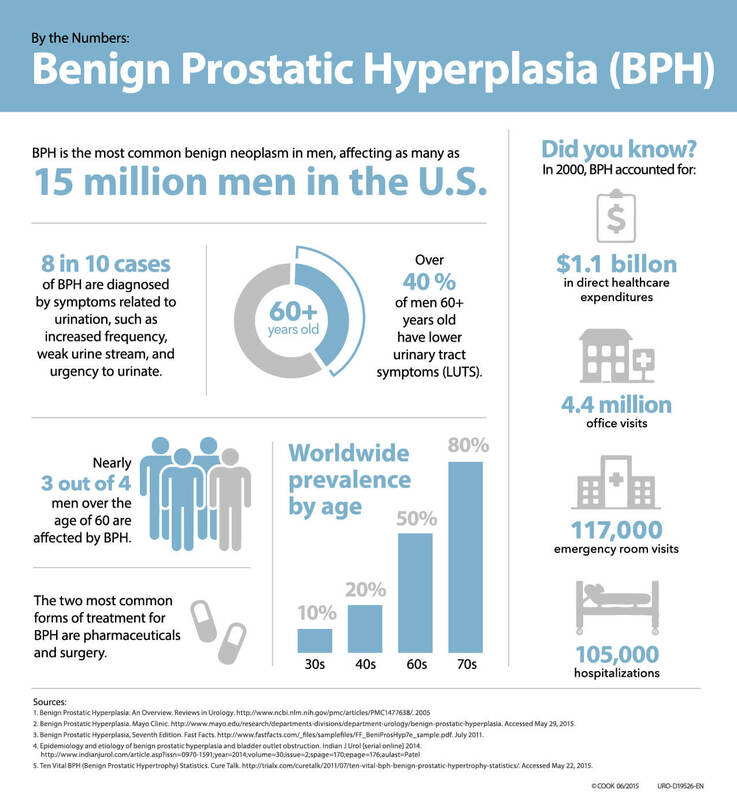 Help us spread the word about BPH and Men’s Health Month by sharing our infographic. And look for more men’s health info on Twitter, @CookUro. U.S. minimally invasive benign prostatic hyperplasia therapy systems market. MedtechInsight Medical Market and Technology Reports. May 2011:ES-1.